…….. as Ken Kesey said, and Wavy Gravy recounted in the luminous new documentary, Going Furthur. This movie is really funny — and not in a you-had-to-be-there way. A huge part of the Merry Band of Pranksters’ essence (as Ken Babbs first dubbed them) was their playfulness and sense of humor. The Pranksters were pioneers in a lot of ways — and one of them was being the first people to not take Pranksters seriously. Lord knows we’ve all seen lots of Merry Prankster documentaries of various stripes over the decades, and except for the actual Key-Z Productions coming out of Ken’s barn, none of them were made by bone fide Pranksters on The Bus. 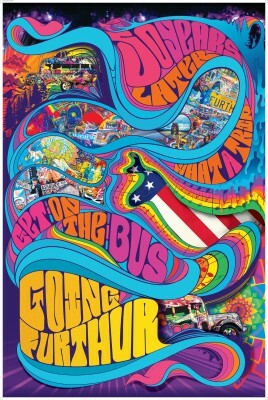 And yes — “bus” in relation to Furthur is always capitalized — because it’s the capital, the captain, the first Bus that inspired it all from Magical Mystery Tour to what’s filling festival parking lots all over America this summer. This film crew didn’t just show up for a couple days and collect some footage. They lived on it for three months, start to finish, on the 50th anniversary tour in 2014, celebrating the historic Neal Cassady-driven trip across the country in 1964. And something happens to you when you’re surrounded by Pranksters morning, noon and night. First of all, distinctions like morning and night stop being relevant. It’s recess all the time. It’s improv theater every waking hour. It’s play time whether your eyes are open or shut. And what a play it is! This is a movie of a road trip worthy of Jack Kerouac, the author at the core of everything the Pranksters did. They went On The Road alright — embracing that wanderlust that Kerouac so passionately first captured — but taking it Furthur. And on boy, did they. Besides everything else — anyone who’s a fan of filmmaking is going to be dosed with several hits of Wow! watching this. The cinematography, the editing, the sound editing, the collages of images, the characters, the costumes, the soundtrack, the settings . . . this is as 21st century storytelling as you get. This is the cinema vérité of madness that was captured and pioneered in America by the Maysles brothers and D.A. Pennebaker — but as edited by Darren Aronofsky on a Terry Gilliam adventure. This is not “chaos cinema” but it’s certainly cinema of chaos. It’s filmed improv with kooky characters a la Curb Your Enthusiasm or Christopher Guest movies — except it’s all on the road and with an even wilder storyline. “Went fast because road is fast,” Kerouac wrote Cassady immediately upon finishing On The Road, and these two Canadian and one American filmmakers applied that same aesthetic to telling this Road story. Zoom! But it also wisely takes the uninitiated on a vivid ride through the backstory. There’s vintage footage of Neal Cassady, Timothy Leary, Ken Kesey, the Acid Tests, The Trips Festival, prototype Grateful Dead, getting crazy at Kesey’s house in La Honda, and what psychedelic light shows were like when they were first being invented — all seamlessly blended in and out of current-day footage of Wavy Gravy, Ken Babbs, George Walker, Zane Kesey, Anonymous, Lee Quarnstrom, Alex Grey, Sam Cutler, Peter Shapiro, Furthur guitarist John Kadlecik, the Wizard of Wonder, and all in locations like the Woodstock reunion at Yasgur’s Farm, the Gathering of The Vibes, Phases of The Moon, the nation’s capital, Manhattan, and Kerouac’s hometown of Lowell, Massachusetts. The unsuspecting viewer’s taken on a helluva trip — from Kesey’s first dose in Menlo Park to the Burning Man desert full of today’s raging rangers — from hand painting the first Bus with their hands to wiring the new Bus for bands — melting ’60s footage into contemporary scenes being goofed and pranked from New York to San Francisco. And boy does it work! There’s George Walker expounding on the participatory philosophy behind the first Acid Tests. There’s original Prankster Roy Sebern explaining how he first misspelled Furthur on the front of The Bus. ……… in real time, in the present time. And besides all the Prankster background and foreground — the film takes a trip through the “festival culture” that’s exploded in North America in the last few years. It’s not about simply going some place to hear a series of bands on a stage — but in direct lineage from the Pranksters — it’s about participation, and breaking down the barrier between performer and audience so both are one, as Kesey first scripted with the Acid Tests, and is now playing out every weekend in hundreds of locations by thousands of people from teenagers to octogenarians. Then the film trips through the power of psychedelics, which is very timely with all the new scientific research coming out on the positive effects that people like Kesey knew about a half-century ago. Ken also used to carry around a giant ball of hemp to public appearances — often saying, “The first state that legalizes it will have a huge jump on the rest of the country” — as the state budget directors in Colorado, Washington and Oregon are learning just how right he was. I wonder how much longer until governments catch up with psychedelics and what millions of people have known for decades? This movie is not just a Jack & Neal road trip buddy picture. This is a huge ensemble cast of disparate people each having their own personal breakthroughs. You can take acid, or go to a Tony Robbins weekend, or have a child. There are a lot of paths to new self-awareness. But throwing yourself onto a psychedelic Bus with a bunch of strangers under madhouse conditions visiting crazy festivals is — as proven in this film — a sure-fire baptism by fire. No one in this movie came out the other side the same person. And the tears shed and hugs long held upon departure showed the heart of this scene. 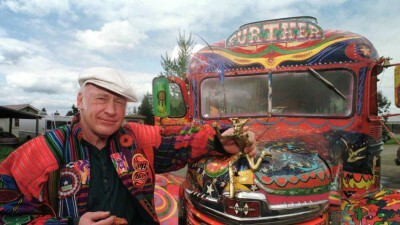 Just as Kesey’s first Bus inspired generations to have wild collective Road Adventures — this film will carry the torch Furthur still, and light the way for those who could use a flash to spark their flame. As Kesey said, “I’d rather be a lightning rod than a seismograph.” And the light he’s been pulling towards him for 50 years is shining out through this movie screen and illuminating a very colorful and beautiful world we are currently living in. Going Furthur will be on the festival circuit and featured in special screenings around the world throughout 2016. 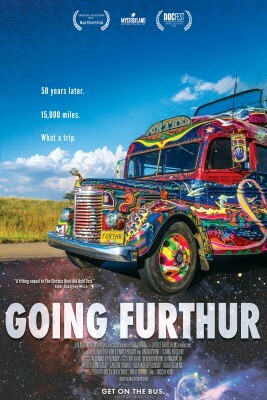 Check the GoingFurthur.com website for screening details. Or via their Facebook page here. I was interviewed for this film, but otherwise had nothing to do with it. Here’s the story behind the reunion summit that video opened. Here’s the first Pranksters In Wonderland in 2015. Here’s The Pranksters at Woodstock — when The Bus went to Yasgur’s Farm on the 50th anniversary tour. 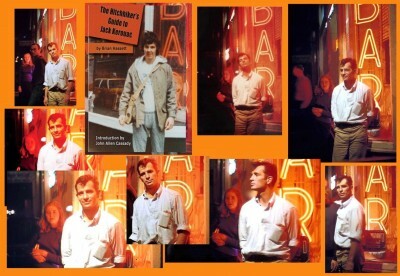 Here’s where you can check out The Hitchhiker’s Guide to Jack Kerouac. And here’s people’s reactions to it. Or a bunch more reviews here. You did it again, Gets Things Done. I love your movie reviews. They’re always MORE than a movie review. Yeeewww-hoooo !!!! On the road again. Never stop you Prankster!!! I hope this is on Netflix or something soon. Please keep us posted. Thank you for sharing the love and magic… I haven’t gotten to attend yet, but thanks to you I can feel the love… Wiz… What can one say to you? Keep spreading the love and living the dream!